Carpet Cleaning Tip How to remove furniture dents! Ice cube. 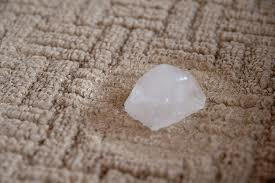 Simply place ice cubes in the carpet dips and wait a few hours or at least until the ice melts. Use a sponge to absorb the excess water, and then use a spoon or a coin to gently lift the carpet fibres. Steam iron. For an entirely opposite approach, lay a clean cloth over the dent and steam heat with an iron. Do not place the iron directly on top of the carpet. Then, gently spoon up the fibres. Damp towel. For deeper dents, lay a moist hand towel over the dent. On medium heat, gently iron over the towel. The fibres will start to spring up under the heat. Leave the towel on the divot and remove when dry. Finally, vacuum over the affected carpet area so the fibres are sucked to maximum height. Blow dryer. You can also spray any dents with water. Then, use a blow dryer to heat the affected areas. Use your fingers to brush up the fibres intermittently through the drying process.